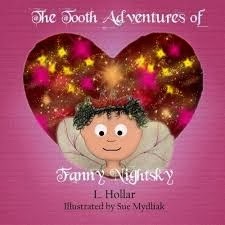 The Tooth Adventures of Fanny Nightsky by L Hollar takes you on a journey with tooth fair Fanny and her fairy in training Zip as they visit the homes of children. Fanny surely has her job set out for her as Zip gets into trouble from house to house. Can Fanny save Zip from the fairy trap or from being eaten by a cat? As Fanny begins to loose her patience with Zip she takes a moment to remember that she was once a trainee too. This is a fun loving book that encourages the creative mind, promoting reading for fun and leisure. I did feel in places that it tended to drag and could be tightened but overall my daughter and myself enjoyed sharing it, which is one of the most rewarding parts of reading with a child. The Tooth Adventures of Fanny Nightsky opened itself to pre-empting what would happen next which created a flow of discussion encouraging problem solving and early story telling skills. This is definitely not a book to be read in a matter of a few minutes but one that you will find yourself taking your time with. There is a little humour thrown in that adults will find amusing and kids will giggle at.